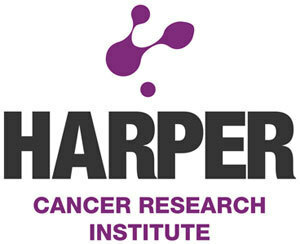 Harper Cancer Research Institute’s third annual Research Day on April 14 (Monday) will gather cancer researchers from the University of Notre Dame and Indiana University School of Medicine-South Bend (IUSM-SB) in a day of exchange and discussion. The event is free and open to the public. A keynote address by Christoph Reinhard will discuss “Translational Strategies in Oncology.” Reinhard is senior director of Translational Sciences Oncology for Eli Lilly and Co.
All events for Research Day will take place in Harper Hall and Raclin-Carmichael Hall at IUSM-SB, where the cancer research institute is headquartered. A display of more than 80 posters from 28 labs, 11 a.m. to 2 p.m. Oral presentations from Walther Engineering Novel Solutions to Cancer’s Challenges at the Inter-Disciplinary Interface (ENSCCII) trainees, 2 to 3 p.m. Oral presentations from 2013 Advancing Basic Cancer (ABC) Research Grant awardees, 3 to 4 p.m. Address by Kate Volker, RiverBend Cancer Services, 4 to 4:30 p.m.
Reinhard keynote address, 4:30 to 5:30 p.m.
Poster awards, 5:30 to 6 p.m. Reception, 6 to 6:45 p.m. Researchers in the Harper Cancer Institute are dedicated to conducting innovative and integrative research that confronts the complex challenges of cancer. The programmatic structure fosters multidisciplinary cancer research by promoting interactions among research groups with distinct expertise and by training young scientists to work across scientific fields. Clinical partnerships provide key translational insight and strengthen the mission of discovery. Originally published by William G. Gilroy at news.nd.edu on April 07, 2014.